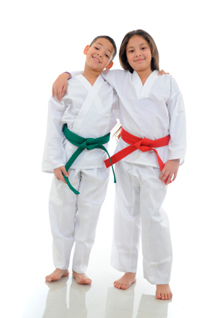 Our junior Karate programmes are built on the core values of Martial Arts training. Karate begins and ends with Courtesy and Respect for yourselves and others. We develop your child’s awareness, self-control and discipline. Our core curriculum includes hi-energy drills and skills designed to build and condition each child’s attitude, behaviour and over all character. Our Junior Karate programme helps children and young adults develop greater self-discipline and self control in everything they do. Safe children make for happy parents. Our highly trained instructor and staff will instil vital safety tips i.e. safety in numbers, non-violent resolution, being cornered and more into your child’s way of thinking when they are with you or friends. As a result they will become more aware of their surroundings. No parent wants their child to live in fear, we believe in helping your child become more confident capable young adults that understand right from wrong. Our practical self-defence system includes karateand ju-jitsu if they go to the ground? Your child will be trained to know when and when not to use their self-defence skills and have a understanding of being responsible for their attitude and actions. Black Belt Leaders are always Victorious! Bullying is a major concern today for parents and teachers. It can range from occasional intimidation to a regime of violence; often children will blame themselves and even parents and teachers can be powerless to end the trauma that a child can be subjected to. Children who learn self-defence usually will never have to use their skills. They learn who to communicate with confidence and are less likely to be a target for bullies/abductors, studies prove that bullies/abductors are looking for a weak looking child, not just in a physical way but a mental one as well. Low self esteem and low confidence can be seen on the outside in the way a child acts and talks, children who act in a more confident manner can be one of the greatest deterrents for a bullies/abductor. 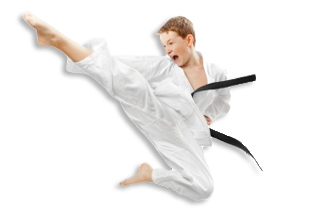 Children that train in the martial arts become more assertive and less aggressive, like adults. If children have a healthy outlet for their energy they become a lot less frustrated and stressed, they might sleep better at night as well, children with a lot of self-confidence will be able to deal with negative peer pressure and ‘SAY NO’ when offered or pressured into things parents would not approve of helping them to stand up for themselves and stand up for life. Healthy spirit that will never give in. Our Junior Karate programmes are designed to build a sense of balance for your child, with all the significant temptations and challenges our young people are presented with today, television, video games, the internet and fast food. Our leadership programme instils the importance of a healthy life style, with exercise and how to build energy with spirit, we are preparing your child to face life’s challenges and want them to be successful in everything they do. In England 1/3 of children are obese and 2/3 are overweight and at risk of health challenges that could course early death. Children on the whole are a lot less active than previous generations because of time spent on the internet, watching TV and playing video games, that they barely have a structured gym class in school, with our programmes we get your child into the best shape of their life. We want to bring the best out of your child, improve their attitude, self discipline, flexibility, tone and strengthen muscles but at the same time we realise it must be FUN. They will be learning variable life skills that will carry over into adult life, someone you will be very proud of.